An eternity ago, the Necrons forsook the frailties of flesh for deathless bodies wrought from cold metal, in their subjugation to the star-gods know as the C’tan. In their new immortal form, they took on the then-masters of the galaxy – the Old Ones – and in aeons-long battle they defeated them. In their desperation, the Old Ones seeded the galaxy with psychic races, thus awakening the horrors of the warp, and the Necrons – weakened by a simultaneous battle of liberation from the C’tan – retreated to their homeworlds. There, falling into hibernation, they slumbered for untold time. As other races were born and drove themselves to extinction, they lay deep and undisturbed in multitudinous worlds, tended and defended in their not-sleep by their monstrous Canoptek automata. Now, across the galaxy, they are awakening. Even here, this Crownworld’s master circuits are stirring. The Necrons – now unthinking machines, save for their few Lords and Triarchs – are arming themselves for war again. Their technology is millennia ahead of that of the galaxy’s younger races. Soon, legions of sinister, advanced war machines will pour from the tombs buried beneath the planet to conquer and enslave – nothing mortal is safe. Even with a glimmer of consciousness to guide them, Necron Warriors are fearsome and resilient foes. Armed with ancient energy weapons, they can scythe down their enemies with lethal volleys of gauss flayer fire, while their unyielding metal bodies repair themselves should they sustain damage. Triarch Praetorians are the ancient law keepers of the Necron race, peerless warriors charged with the survival of the dynasties and the primacy of the ancient Necrontyr codes. They can use their rods of covenant both in melee and in ranged combat, and they can fly past obstacles with their gravity displacement packs. Destroyer Lordsare the most maniacal of their kind. This is chiefly because they retain far more intellect than baseline Destroyers, and can bring all their fearsome intelligence to bear in their pursuit of universal oblivion. 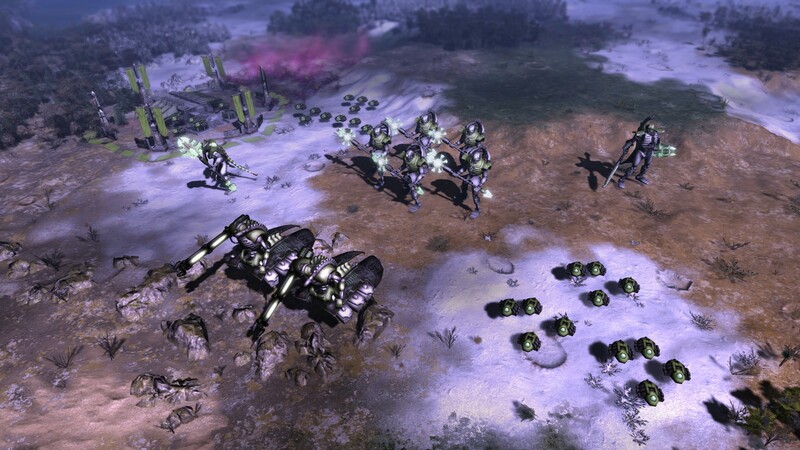 Necron Lords, though lesser in stature and power than an Overlord or phaeron, are nonetheless formidable foes in their own right, and often march to war at the head of a vast mechanical army. 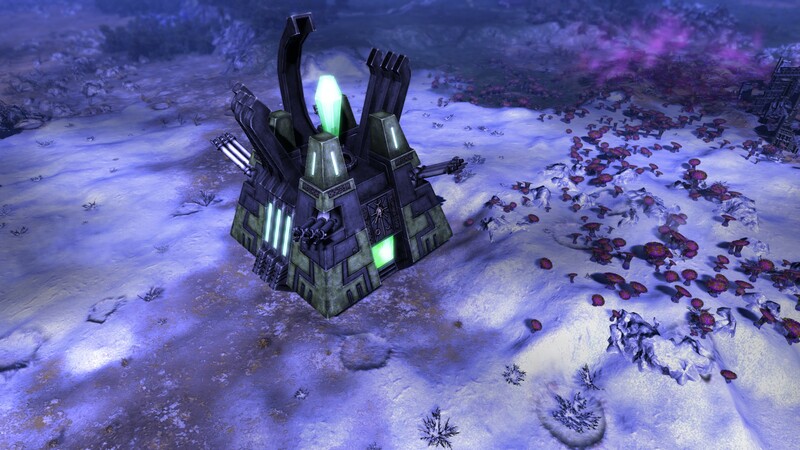 Armed with oversized gauss cannons, Heavy Destroyers send blazing energy blasts searing across the battlefield. These heavily armed adherents of the Destroyer Cults glide across scorched earth scanning for victims, the flickering light of their weapons’ energy cores echoing the cold hatred in their optics. Canoptek Scarabs sweep across the battlefield in vast undulating swarms that devour all in their path.Crypteks bend the forces of the universe to their will, creating impossible technology and esoteric weaponry to lay waste to armies and destroy worlds. Transcendent C’tan are all that remain of the once mighty star-gods. They are echoes of their former selves, splinters of energy that survived the Necrons’ betrayal and were trammelled in tesseract labyrinths. Even in their reduced and fettered state, Transcendent C’tan are still beings of immense power. Though essentially an automated drone, a Canoptek Spyder is nonetheless a formidable foe. Its vast array of self-repair and back up systems offer substantial protection against incoming fire. In return, any enemy that strays within reach of the Canoptek Spyder will have flesh scoured from bone by a multitude of mechanical tools and pincers. Like an enormous spider, a Triarch Stalker looms over the battlefield, its devastating weaponry directed by a high-ranking Triarch Praetorian. When a Triarch Stalker advances, it does so with a speed and surety that belies its jerking gait. Indeed, it can cover all manner of terrain with a deftness and precision seldom found in the walkers of less advanced races. 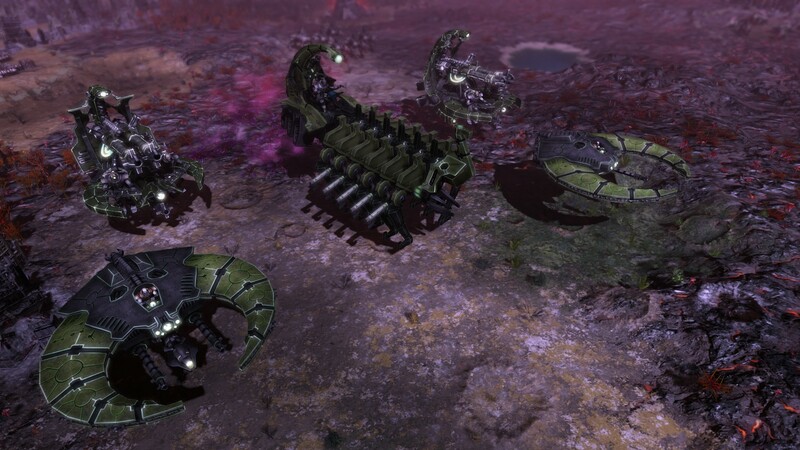 Operated by slaved Necron warriors but guided by super-complex navigation programs, Tomb Blades are contra-gravity crafts which move with a speed and agility no living pilot could hope to match. 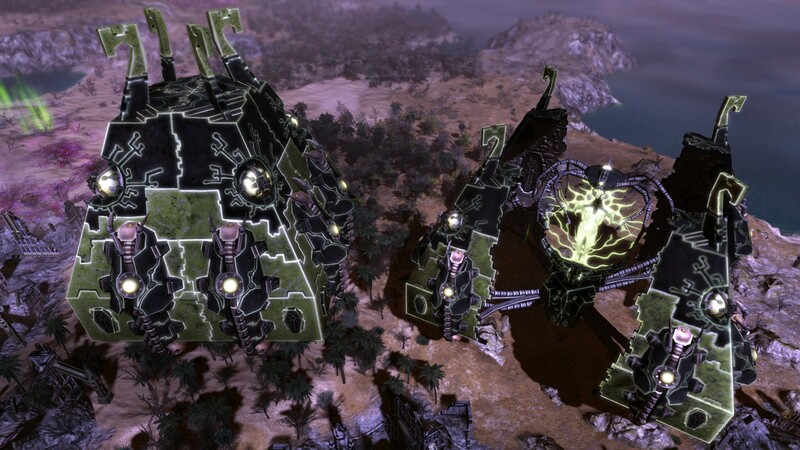 Annihilation Barges are the Necrons’ favoured anti-infantry support platforms. At the Overlord’s command, the Annihilation Barges’ ancient repulsor sleds are coaxed back into life and the vehicles accompany the tomb world’s army to war. 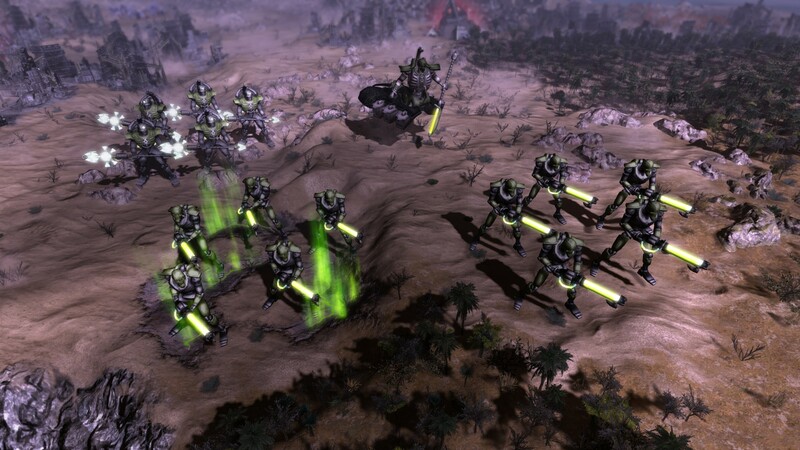 Victory through overwhelming firepower is a common tenet of Necron strategic thinking. Nowhere is this more evident than in the Doomsday Ark. Though deceptively fragile at first glance, the Doomsday Ark is a self-propelled energy cannon whose raw, unsubtle firepower is so vastly destructive that a single shot can turn the tide of a battle. The Night Scythe is the Necrons’ favoured tool of invasion, a sickle-winged herald of woe that possesses the ability to beam Necrons directly into battle. Doom Scythes are heralds of terror and dismay. These supersonic fighter craft range ahead of a Necron army, drawing upon their strategic datastacks to operate with virtual autonomy. The Monolith is an ancient war monument of unimaginable destructive potential. When its massive silhouette looms over a battlefield, it will lay waste to entire armies with strobing torrents of gauss fire and the deafening crack of its particle whip. The Obelisk hovers low over the battlefield, the somnolent hum of its gravitic repulsors sowing dread in the hearts of the foe. As it drifts into view, black lightning arcing across its glowing hull, the Obelisk presents a darkly majestic sight. Yet wonder turns swiftly to horror as the Obelisk’s weapons cycle up, glowing tesla spheres rising open to spit crawling skeins of lightning that reduce those nearby to blackened, twitching husks. Only a race as ruthless and self-serving as the Necrons would think of unleashing a Tesseract Vault to further their ams – though each Vault is a potent weapon of war, the beings held within these floating prisons pose an almost incalculable threat.